Private Guided Hagia Sophia Tour. The Hagia Sophia, one of the historical architectural wonders that still remains standing today in the world. That's why in Tours4Turkey Travel we have decided to offers a dedicated fully guided Hagia Sophia Tour. Just to give you a glimpse of the grandness, importance and functionality of Hagia Sophia, you should know the white marbles used in the structure came from the Marmara Island, the green porphyry from Eğriboz Island, the pink marbles from Afyon and the yellow from North Africa. The decorative interior wall coatings were established by dividing single marble blocks into two and combining them in order to create symmetrical shapes. During the East Roman period, the Hagia Sophia was the Empire Church and, as a result, was the place in which the emperors were crowned. Hagia Sophia is known as Aya Sofya in Turkish. Unfortunately nothing remains from the first-original Hagia Sophia which was built on this site on fourth century by Emperor Constantine. Hagia Sophia was burned down during the Nika riots of 532 and the present form was built between 532-537. Pickup from your hotel and drive to Old Town of Istanbul. 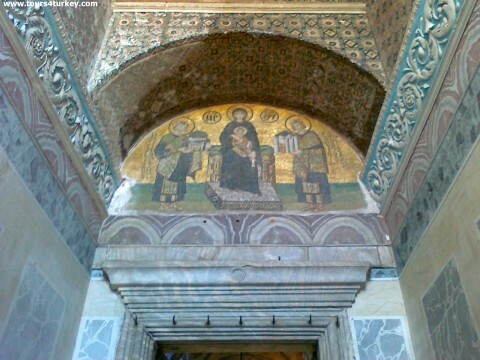 The Hagia Sophia Guided Tour takes 2 Hours of an exclusive interior visit. During the Hagia Sophia Tour your professional Istanbul tour guide will explain the legendary history and unique structure of Hagia Sophia. After the tour our driver will take you back to your hotel. Note: The Hagia Sophia tour is a private one and you can visit Ancient Hippodrome and Blue Mosque as extension with no extra charge. Please inform us in advance if you want your Hagia Sophia guide to show you hippodrome and Blue Mosque as well.